Cooling a high-end CPU used to be a challenge back in the day, but the modern crop of efficient chips is such that just about any well-made air- or liquid-cooler will do a decent job. You might see a small variance in performance, and noise output tends to be a better differentiator of the best models, yet for most users the buying decision is much of a muchness; anything cheap and cheerful will do. 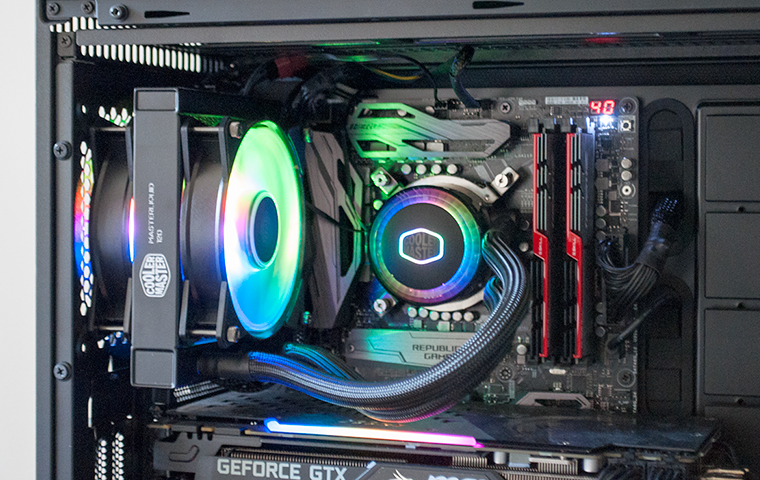 But there's no harm in giving your PC an extra layer of bling, and for the enthusiasts who like a rig that looks as good as it performs, manufacturers have taken to RGB lighting as a point of temptation. 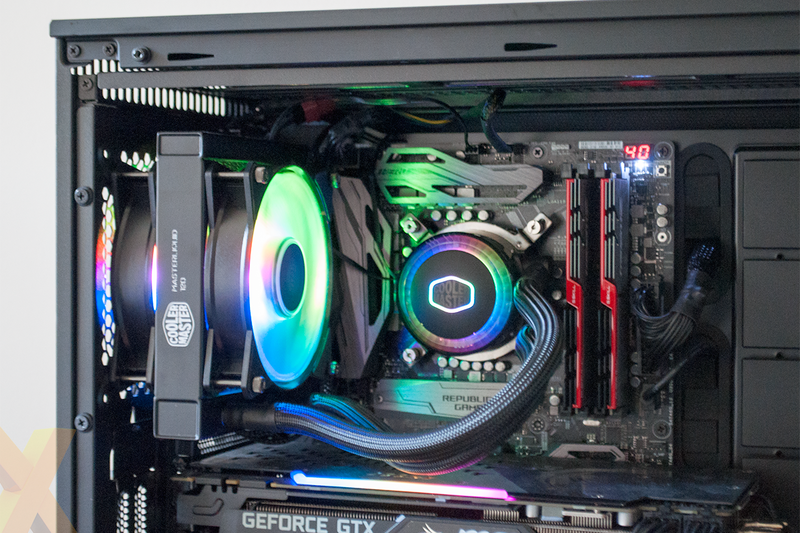 Just about every component can be illuminated in a modern build, and the once-humble CPU cooler can be the most eye-catching element if done right. NZXT's Kraken is arguably the most stylish example we've seen of RGB lighting on a liquid cooler thus far, but Cooler Master is aiming to go one better with a pair of new additions dubbed the Master Liquid ML120R RGB (£100) and ML240R RGB (£110). 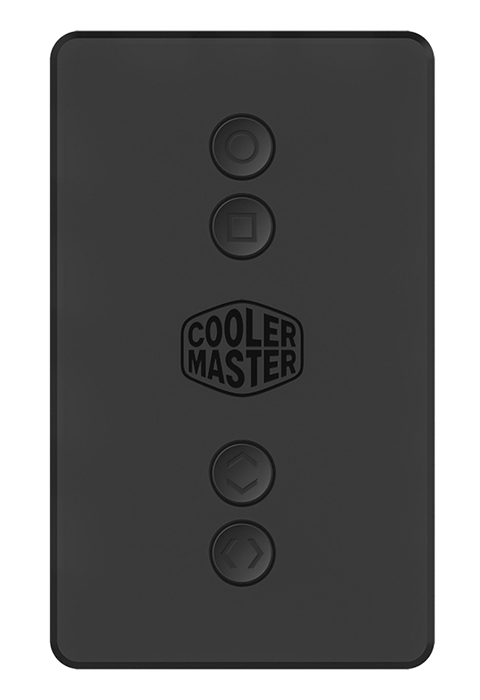 The names don't exactly roll off the tongue, but if you deem other coolers too sedate in their appearance, you're going to appreciate Cooler Master's vivid approach. We have the ML120R in for review, and first impressions are positive. Designed and manufactured in-house, Cooler Master's all-in-one solution feels well-knitted together and uses a sleek all-black finish to contrast and further emphasise the multiple zones of RGB illumination. In keeping with most compact, closed-loop coolers, ML120R features a 120mm x 157mm x 27mm aluminium radiator that attaches to a pump via flexible and sleeved FEP tubing. 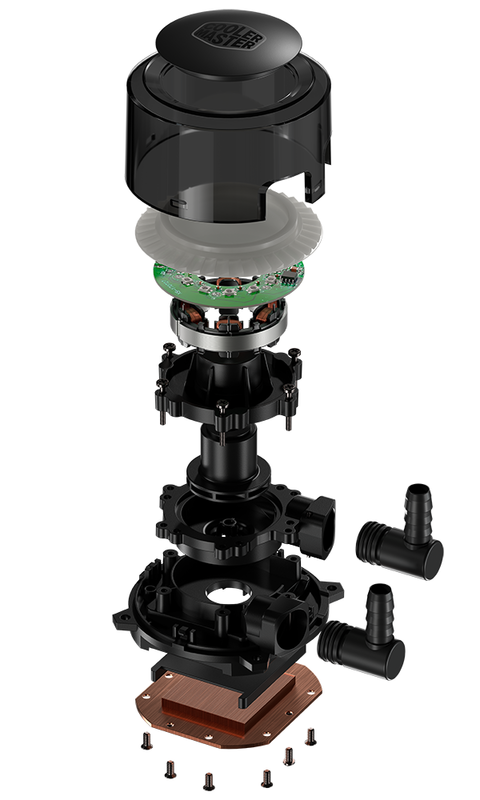 The compact pump is one reason to consider the liquid cooler over a traditional heatsink and fan - it frees up space around the CPU socket - and Cooler Master is using a dual-chamber design that is said to aid heat transfer. Cooling performance should no doubt be decent, but the primary reason to consider the ML120R is all that RGB goodness. Cooler Master has 12 individually addressable LEDs behind the pump's top ring to provide near-seamless transitions, and the illumination doesn't stop there. 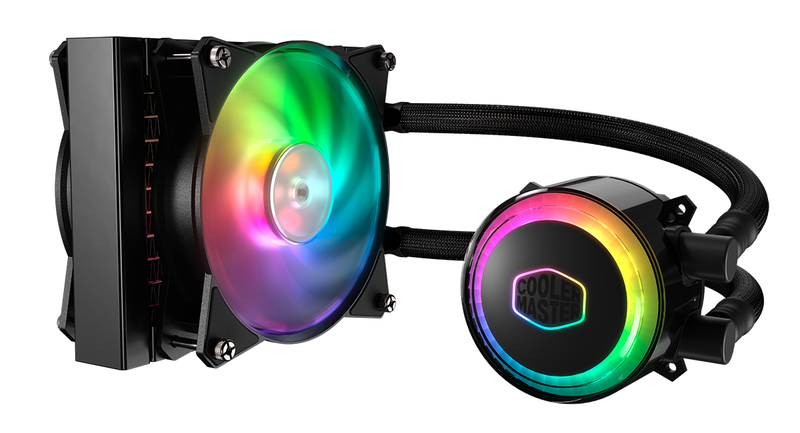 The border surrounding the Cooler Master logo is also backlit (though the text curiously isn't) and the duo of bundled four-pin MF120R RGB fans are equally bright with eight addressable LEDs apiece. It's a good-looking collection of kit, there's no doubt about that, however the lighting implementation does result in a fair few wires to contend with. Whereas modern equivalents such as the be quiet! Silent Loop and Fractal Design Celsius simplify installation to just a cable or two, the MF120R installation kit includes over 60 individual pieces. 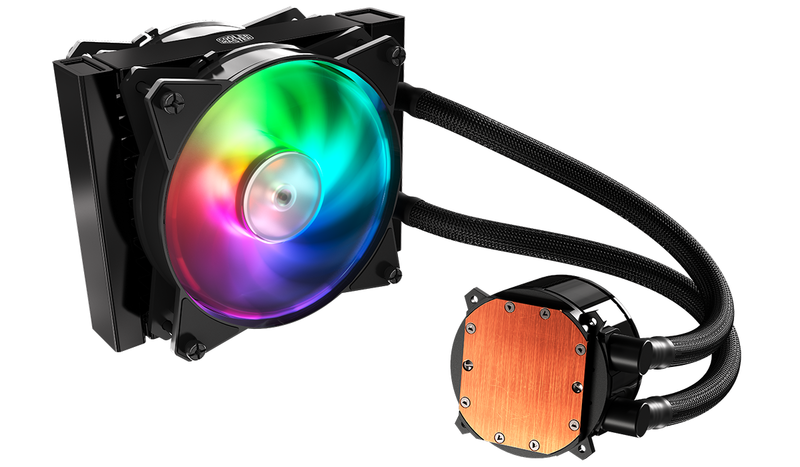 The pump and fans each have two cables - an RGB header as well as three- and four-pin power connectors, respectively - and Cooler Master includes a two-way splitter for the PWM fans as well as a three-way splitter for all the RGB. That should mean you only use three motherboard headers (three-pin pump power, four-pin fan power and addressable RGB), however if your motherboard doesn't support addressable lighting, Cooler Master bundles a dedicated controller for managing colours, effects and speed. The controller is nice and compact, and we like the fact that the back is magnetic for easy attachment inside a case, but cabling gets even more complicated. 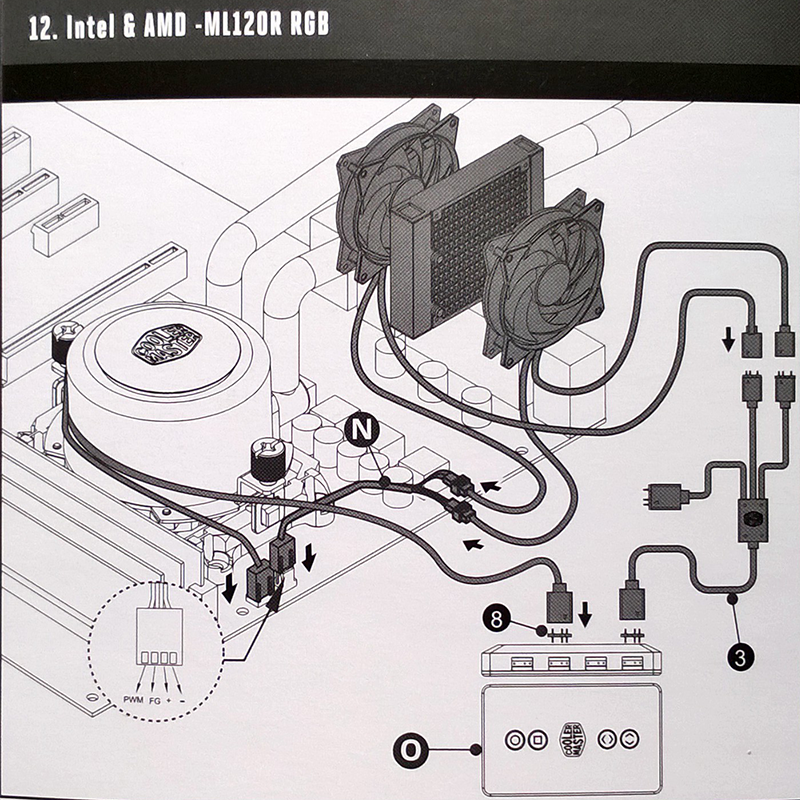 Page 12 of the manual shows the RGB headers connected to the controller via small three-pin adapters, and you'll also then need to add a SATA power cable as well as a USB cable if you wish to utilise Cooler Master's MasterPlus+ software utility, which is still in development and due to arrive at a later date. Installation therefore isn't entirely straightforward, but there is merit to Cooler Master's wired controller as it fully supports Addressable RGB on up to four channels, allowing individual control of each LED on the pump, fans, and any other compatible strips you choose to attach. Controlling the effects via the controller buttons is somewhat cumbersome - you'll need to refer to the manual or video tutorial to keep track of the various button presses - but while we await the MasterPlus+ software utility, the ML120R is certified compatible with the likes of Asus Aura Sync, ASRock Polychrome Sync and MSI Mystic Light. Take the lighting out of the equation for a moment and the cooler itself is easy to mount. All the latest Intel and AMD sockets bar Threadripper are supported, and it's merely a case of securing a mounting bracket to the rear of the motherboard via the supplied standoffs and then fixing the pump on top. Cooler Master bundles a small tube of thermal paste that's good for a couple of remounts, but given the £100 asking fee, it's a shame the kit is backed by only a standard two-year warranty. Still, if lighting is a priority and you're limited to a 120 rad, the ML120R seems to be an obvious choice. Let's see if performance is up to scratch.